Maradhi Manni: Unexpected Trip To Azhagar Kovil, Noopura Gangai And Trees Where Hundreds Of Weaver Bird Nests Hang From Trees! Unexpected Trip To Azhagar Kovil, Noopura Gangai And Trees Where Hundreds Of Weaver Bird Nests Hang From Trees! As all my friends know by now that we go to Trichy to visit our family deity once every year. This time after visiting our Gunaseelam temple, we went to Madurai and from there to Kallazhagar Kovil, which is situated 21 Km. from Madurai. I will write about Madurai Meenakshi temple later. I was more fascinated by this temple and the Noopura Gangai hill. Actually, my husband wanted to visit Thirupparangundram and Pazhamudircholai. We visited Thiruppangundram on our way to Madurai and this time we visited Kallazhagar Kovil, Pazhamudircholai and Noopura gangai which is near the Pazhamudircholai temple. 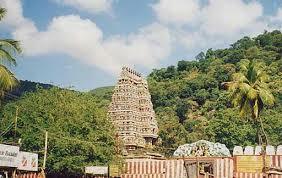 Kallazhagar temple is situated at the foothills of a range of hills called Azhagar malai. 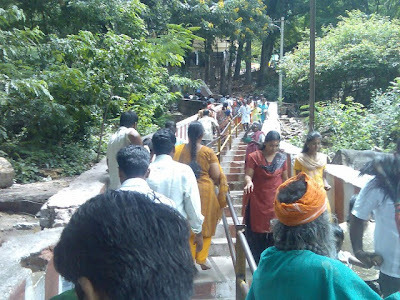 Pazhamudir cholai is situated at a higher level, around 4 Km. uphill from here. Noopura Gangai comes next. The deity is Vishnu and he is called as Paramaswamy here. The processional golden deity is called 'Kallazhagar' (Sundararajan also). 'Kallar' means 'thief' and 'azhagar' means 'a beautiful person'! He steals the hearts of his devotees by blessing them, it seems! This is quite a huge, ancient temple built by the Pandya Kings/Nayakkar kings and patronised by Krishna Deva Raya. The temple has got Dravidian type gopuram with beautiful sculptures. During Chaitra month's utsav, the processional golden deity (Utsava moorthy) is taken to Madurai for the celestial wedding of Shiva and Parvathi (Sundareshwarar and Meenakshi). As per our mythology, Vishnu is the brother of Meenakshi. She is married to Shiva. Vishnu hands over his sister's hand to Shiva here! Read more about it here. (Vaishnavites, followers of Vishnu and Shaivaites, followers of Shiva, worship these gods together, here, for once!). I was fascinated by the Karuppanna samy temple which stands in front of the Kallazhagar temple! It has got 18 steps and nobody dares to lie in front of the deity! Karuppanna samy is supposed to be the village deity. It is quite huge. We have to enter Kallazhagar temple via this temple! It was a Sunday and some 3 local weddings were going on! This temple is famous for its sculptures. We didn't have much time to spend here...hopefully, I will take more pictures and post again! We noticed a closed, huge door inside which Vishnu's Chakra is kept it seems and the door opens only once a year. Different stories are told about this temple. We had the famous 'kallazhagar kovil dosa'...this is famous like our Tirupati laddoo! I noticed coarse rice powder, pepper, curry leaves and coconut as ingredients in this dosa. They fry it in ghee, it seems, though I doubt it! It was dripping with oil, but the taste was good. Then we went up to Noopura Gangai. It is said that when Brahma poured water from his kamandal on Vishnu's feet, the water fell on earth and they became rivers like Ganga in the north India and the water which fell down via his anklet fell on this hill and is called Noopura Gangai(salangai aaru...anklet river!). The water is full of medicinal values and taking bath here cures many ailments, it is said. Nobody knows where the water originates from. The bathing area was very crowded. People tonsure the hair of their babies and bathe here. Another deity, called Rakkaayi also is here which is famous for the local people. Actually, the water comes out from her Garbagruha - sanctum sanctorum. We collected some water in a bottle and sprinkled on our heads! The water didn't have any smell, though! The dots hanging down the trees look like weaver bird nests, are they? Click on the picture to view clearly. This area is full of trees. This is sort of a 'herbal forest'. Famous for Bisons, it seems. But this is new. We had seen weaver bird nests at Aathoor and wrote about it here. This is the place where we parked our car. You can see the trees in the background. The next temple was Pazhamudir Cholai. This is the sixth abode of Lord Muruga (Subrahmanya). The six abodes are called 'Arupadai veedu'! The deity Muruga is with his two wives, Valli and Deivayaanai here. The temple is small. I have seen other Murugan temples and all were huge temples. This temple and the whole area is full of beautiful monkeys. More than me, my husband clicked more photos here...our ancestors, it seems! I think I will write more later about this trip. Ooh...how many 'it seems' are there! Gopuram pictures: Thank you, Google! ASHOK; Thanks for the prompt comment, Ashok! You must be knowing about the hanging bird nests. Have you noticed them? I was just now telling my daughter let us go to Kalazaghar kovil,Noopura gangai,Madurai and nearby temples.When she looked at me with a suprise at this sudden request I asked her to read your post and then she would also feel an irresistible yearning to visit these holy and verdant places.Thank you,Sandhya, the description brought before us the very scenes you enjoyed. Nice post with detailed description and lovely pictures. We had visited in 2011.We found a lot of monkeys in Azhagarkoil as well as Pazhamudir Solai. K PARTHASARATHY: I forgot to mention that this temple is one of the 108 Divya desams. Please visit our temples on a working day, you can enjoy more! RAMAKRISHNAN RAMANATHAN: Yes, monkeys were seen everywhere. Will visit your blog now. Thank you, Ramakrishnan. I have not seen a weaver bird nest in person, should visit these places to see them once. Thanks for the info on Azhagar Kovil. When we visited Madurai recently, we missed going to this Kovil due to time constraint. I just started to write my next post on Madurai. It will be published within a week. DESTINATION INFINITY: I have no idea about Rajni's song. Have you seen 'Thiruvilaiyaadal'? One story about Muruga with avaiyaar is there. Muruga is disguised as a small boy sitting on a ilandai pazham (fruit) tree. Avaiyaar, an old woman, comes there and sits under the tree and she is hungry. Muruga asks her 'paatti are you hungry?' She says 'Yes'. Muruga says 'I will drop some fruits for you...do you want burnt/hot fruit or unburnt fruit?' She was too tired to think. 'Anything will do', she says. Muruga says, 'If I drop the fruits down, it will be full of mud and you will be blowing air from your mouth, as if it is hot and then eat the fruit. If I give you in your hand, you can eat just like that'! This story happened here as per the movie! This place is worth visiting for the architecture and sculptures. I will go there again. SG: We had planned to go to Pazhamudircholai, not Kallazhagar Kovil. If we had planned, I would have read about it first before going. Lots of things were missed during this trip. Waiting to read your Madurai post, SG! RENU: When you plan to visit temples or any place, nowadays, I read about them in internet. It is easy to follow and know what to see. Try this method, Renu! Well narrated, and the pictures add to the interest too! For me it looks like 'bats' hanging on trees! I always like place around mountain and forest, and Azhagar Kovil and hills seem my kind of area to vvisit. My parents always wanted to visit those temples sometime... and we visited Menakshi temple and thiruparangundram very long back. Nice post and details on Kallazhagar and Noopura Gangai. Yeah, water must be rich in medicinal properties cause it flows through rocks and roots of trees, collecting minerals! But with rise in population and too many people taking bath, I think it gets polluted easily and isn't the same like it used to be during olden times. Beautiful pictures and beautiful narration.Many times after reading blogs like yours, I feel I must visit some places. USHA PISHARADY: Thank you, Usha! JEEVAN: No, I don't think they are bats. They were making too much sound in the early morning. They are night birds, right? Though, I too had a doubt like you! We went to Thirupparangundram and Meenakshi temple too. Will write about them later. I loved these temples mostly because of the area they are situated. And the Kallazhagar temple was huge and ancient which I love to visit. I am sure you will like this. SAI CHARAN: Our people never follow rules. The bathing area was too crowded and people were shouting at each other. We just watched, asked somebody to collect some water in a bottle and left the area. The bird area was the attraction. We couldn't see even a single bird though, just heard the sounds. RAMA ANANTH: This place was interesting, Rama! You will enjoy! ONKAR: Thank you, Onkar! I always love birds and animals. Wrote many posts about them! RAMAKRISHNAN RAMANATHAN: I like your writing and so was eager to read them, Ramakrishnan. A lovely place indeed and wish I could visit it someday, Sandhya:)A very enjoyable read! 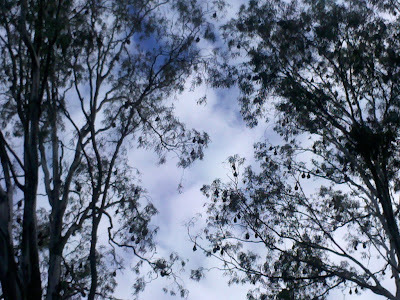 ASHOK: As soon as I saw the tree, I could see the hanging nests. This link, http://en.wikipedia.org/wiki/Pazhamudircholai says that hundreds of bats hang from the trees here. My son also said that they won't make so much sound in the morning. Can you please edit in wikipedia? You can do it. It is better not to leave wrong information there. I didn't take my nikon camera. I could have taken a close up clear picture from that. Lovely pics. Particularly like the hanging nests of the weaver birds! MANJU JOGLEKAR: The Vishnu temple is a very ancient one and as you know the architecture in these types of temples are great and unique. I spent a lot of time and clicked many pictures. Selected just two to post! 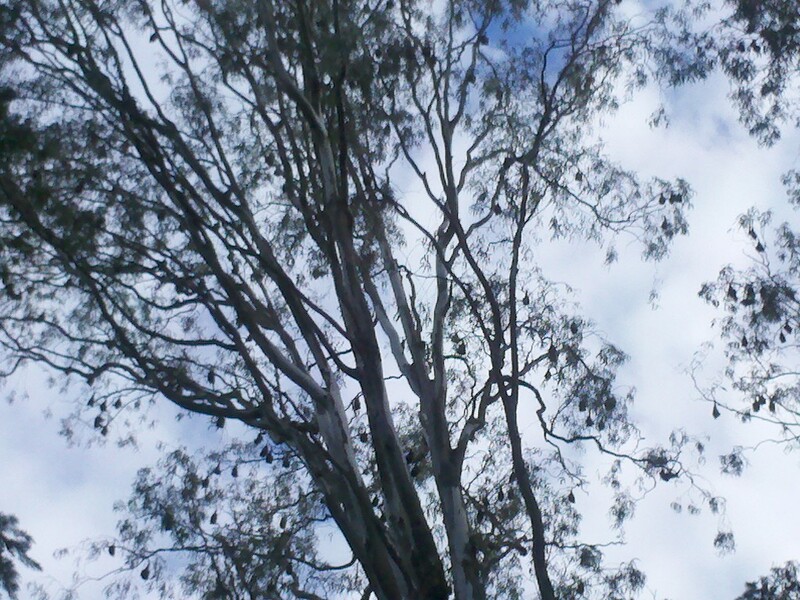 VARUNAVI: Hundreds of nests are hanging there. I couldn't locate a single bird anywhere down the way. Maybe the place was crowded because it was a Sunday and some 3 weddings were going on in the Vishnu temple nearby. People would come here too. I will go there again some day. Thanks Saritha for the comment. I know that you don't have spare time at all. Take care. Interesting post, Sandhya. Love the weaver bird nests! 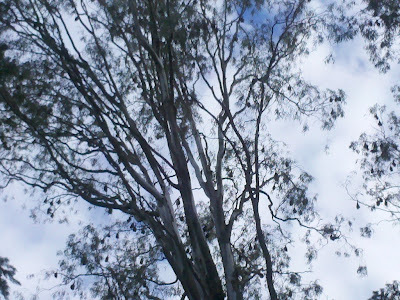 SHAIL MOHAN: We saw the trees with bats in Srilanka, remember? So many were there! Thank you, Shail!